CHICAGO (WLS) -- Couples who want a wedding of a lifetime have just a few more days to submit videos for the Willis Tower's annual Valentine's Day Wedding Experience. 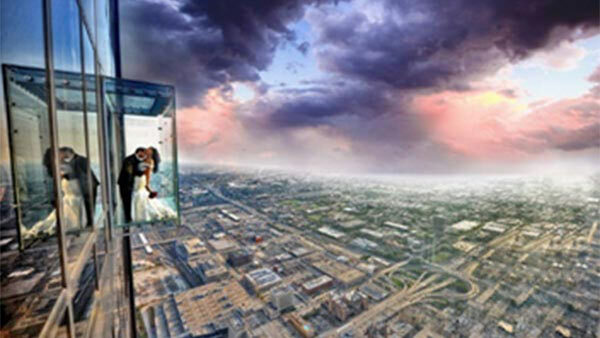 Four lucky couples will get to say "I do" on the Skydeck's ledge, 103 stories in the air. Couples have until Tuesday to submit a video on the Skydeck's Facebook page. The four winning couples will be notified on Thursday. Contestants should explain why they should win the contest in two minutes or less. Couples are encouraged to share their most romantic stories, including how they met and why they want to spend their lives together. Winners will get to exchange their vows on the ledge accompanied by eight guests in a private 15 minute ceremony on Valentine's Day. After the ceremony, the newlyweds will celebrate with a champagne toast and receive their wedding gifts from Crate and Barrel and each couple will receive a complementary photo taken by Willis Tower's in-house photographer. The contest is open for couples looking to proclaim or renew marriage vows. Willis Tower says there have been more than 860 marriage proposals at the Ledge at the iconic Chicago skyscraper.